The two newest plaques on The Galway Poetry Trail will be unveiled at The Spanish Arch, Galway on Tuesday, April 9th @ 3pm. An extract from ‘Priest’ by Ken Bruen will first be unveiled on the wall outside Ard Bia Nimmos restaurant. The subject of the piece is Long Walk and it will be unveiled by singer Johnny Duhan who will also perform his song, ‘The Voyage’. A plaque of ‘A Town Tormented by the Sea’ by Loughrea born author, Mary Devenport O’Neill will then be unveiled on the corner of Jury’s Inn by Niall McNelis, Mayor of Galway City. The plaques are being sponsored by Galway City Council who have funded most of the trail’s plaques through Arts Officer James Harrold, and the events form part of the Cúirt International Festival of Literature which runs until April 14th. The plaques are the latest addition to the Galway Poetry Trail which is an initiative of Tom Kenny of Kennys Bookshop & Galway City Council. It is a series of over twenty poems and writings on plaques that are dotted around Galway city on a literary trail, each reflective of their locations. The trail includes both English and Irish language poems by writers such as Pádraic Ó Conaire, Moya Cannon, Máire Holmes and Seámus Heaney. Locations where you can find the poetry plaques include NUI Galway, the Salthill Prom, Tigh Neachtain and outside the Galway City Tribune office. 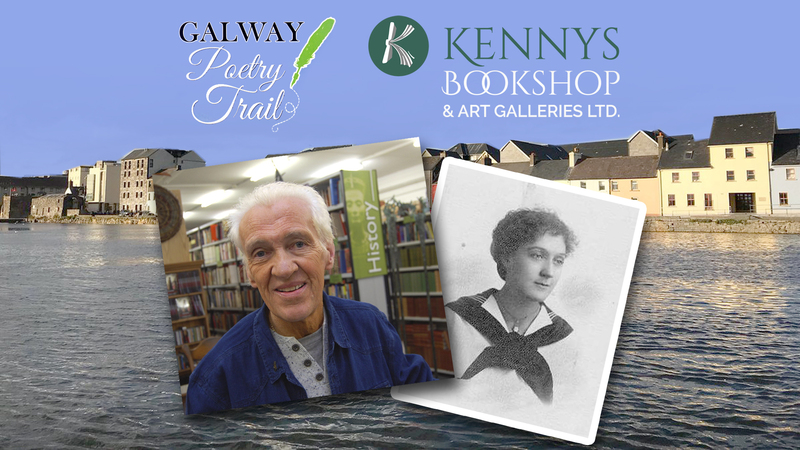 For more information on the Galway Poetry Trail, contact sarah@kennys.ie.